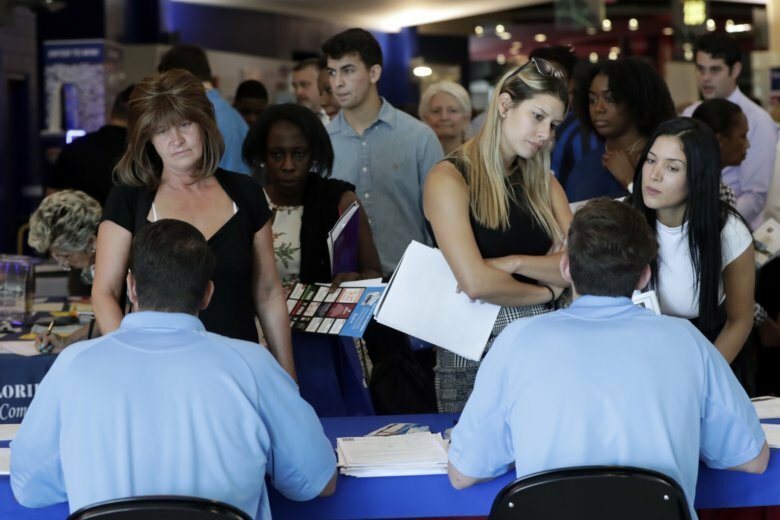 WASHINGTON (AP) — The U.S. unemployment rate fell in September to 3.7 percent, the lowest since 1969, when young men were being drafted to fight in Vietnam and the American auto industry and the space program were going full blast. The Labor Department reported Friday that the rate edged down from 3.9 percent the month before as employers added 134,000 jobs — a figure that was probably depressed by the effects of Hurricane Florence in the South. Still, it extended an extraordinary 8½-year streak of monthly job growth, the longest on record. That run has added nearly 20 million people to the nation’s payrolls since the Great Recession, which cost nearly 9 million their jobs. The ultra-low jobless rate — the best in nearly 49 years — reflects a healthy economy driven by strong consumer and business spending. In fact, hiring is so strong that employers are having trouble filling openings and some are being forced to offer higher pay. Despite the similar unemployment rates, today’s economy is vastly different from that of 1969. Back then, one-third of Americans worked in manufacturing; now it is barely 9 percent. Strong economic growth back then was propelled by huge government spending on the Vietnam War and newly created Great Society social programs. And women were much less likely to work. In reporting September’s employment figures, the government revised sharply upward its estimate of hiring for July and August. So far this year, monthly job growth has averaged 208,000, compared with 182,000 last year. “The acceleration in job gains this year is extraordinary in an environment where firms are having great difficulty finding qualified candidates,” said Stephen Stanley, chief economist at Amherst Pierpont Securities. Most analysts blamed the slower pace of hiring last month on Florence, which struck North and South Carolina and closed thousands of businesses. The category that includes restaurants, hotels and casinos lost jobs for the first time since September 2017, when Hurricane Harvey hit the Houston area, and retailers last month shed 20,000 jobs. Many of those jobs are likely to bounce back in the coming months. Pay gains remain modest but are showing signs of accelerating. Average hourly pay in September rose 2.8 percent from a year earlier. With unemployment so low, companies are facing intense pressure to raise pay to land workers. Amazon this week raised its minimum wage to $15 an hour. Paul Millman, chief executive of Chroma Technology, has struggled to find enough machine operators and engineers for his 135-person company, based in Bellows Falls, Vermont. It makes filters for handheld medical equipment, food safety test systems, and virtual reality headsets. The company is doubling the size of one of its plants and increasingly automating its assembly process because it is so hard-pressed to find employees. It has also started calling back people who previously applied for jobs but weren’t hired. That has resulted in two new hires. Financial markets were down sharply in afternoon trading, with the Dow Jones average falling 202 points in afternoon trading. Investors have grown concerned about higher interest rates and the effect they might have on the economy and the stock market. Friday’s jobs report will probably keep the Federal Reserve on track to raise short-term interest rates, economists said, with another increase expected in December. The economy does show some weak spots. Sales of existing homes have fallen over the past year, held back in part by higher mortgage rates. Auto sales have also slumped. Manufacturers, which are more dependent on foreign markets than other industries, added 18,000 jobs last month, a sign that President Donald Trump’s trade fight with China and other countries is having little effect on hiring. Still, should the tariffs remain fully in effect a year from now, roughly 300,000 jobs could be lost by then, according to Mark Zandi, chief economist at Moody’s Analytics.